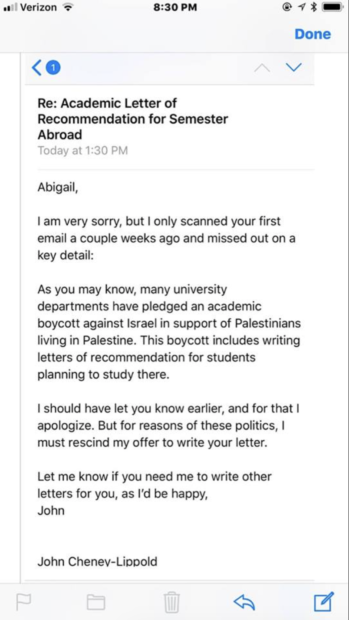 A spokesperson for the University of Michigan denounced a professor who had allegedly refused to write a student a letter of recommendation because that student was planning on studying abroad in Israel. Fitzgerald did not definitively confirm the email was from Professor John Cheney-Lippold but issued the statement anyway. Fitzgerald also refuted the professor’s alleged claim that school departments have made pacts to boycott Israel. “No academic department or any other unit at the University of Michigan has taken a position that departs from this long-held university position” of “consistently [opposing] any boycott of Israeli institutions of higher education,” he stated. Cheney-Lippold did not respond to requests for comment.